The Nordic Cafe - Where skiing is rewarded ... with cookies! Located in the main building just off the ski shop is the Nordic Cafe. Sit by a sunny window and relax with a bowl of homemade soup and a grilled cheese sandwich. Made with Cabot's Vermont Cheddar, our grilled cheese sandwiches in all their varieties taste wonderful after a long ski. Marion and Dana cook up huge pots of soup or our famous Veggie Chili on the weekends. Soup and hot or cold sandwiches are available every day, but the menu expands on the weekends. Hot and cold drinks, snacks, and many other goodies can be found in the cafe. Hot cider made with Vermont's own Cold Hollow Cider is an after-ski favorite. Order a trail lunch to take out to The Hut or one of the many picnic tables out on the trails. Call in your order by 10am, and we'll have it ready for you to take out on the trail. 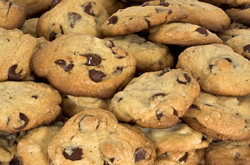 If you are lucky, you just might arrive in time to get a warm cookie fresh from the oven.